The multi-functional, multi-layer sensing skin is applied to a polymeric substrate with a physical crack and a reservoir for exposing the sensing skin to aggressive ions. Credit: Julie Williams Dixon. Researchers have developed a multi-layered "sensing skin" to detect corrosive or otherwise harmful substances in structures. The skin can also detect cracks and other structural flaws that are invisible to the naked eye. "We've created a skin that can be applied to the surface of almost any structure and be used to monitor the structure's integrity remotely and in real time, identifying potential problems long before they become catastrophic," says Mohammad Pour-Ghaz, an assistant professor of civil, construction and environmental engineering at North Carolina State University and co-author of a paper describing the work. The sensing skin consists of three layers, which can be painted onto the surface of a structure or pre-assembled and attached to the surface like wallpaper. The first layer is electrically conductive and is used solely to detect cracks. The second layer serves as a buffer between the first and third layers. The third layer detects cracks, but is also engineered to detect specific chemicals of interest. If users want to monitor for chemicals coming out of a structure – such as leakage of the chemicals out of a containment structure – the third layer would face inward, touching the structure's surface. To monitor external chemicals, the third layer would face outward. Here's how the sensing skin works. Electrodes are applied around the perimeter of a structure. The sensing skin is then applied to the structure, over the electrodes. A computer program then runs a small current between two of the electrodes at a time, cycling through a number of possible electrode combinations. When the current runs between two electrodes, a computer monitors and records the electrical potential at all of the electrodes on the structure for both the first and third layers of the sensing skin. This data is then used to calculate the sensing skin's spatially distributed electrical conductivity on both layers. The researchers have developed a suite of algorithms that can use changes in conductivity measured by the first and third layers of the skin to detect and locate both damage and the presence of target chemicals. An example of testing a multi-layer sensing skin for detecting chlorides and cracking. 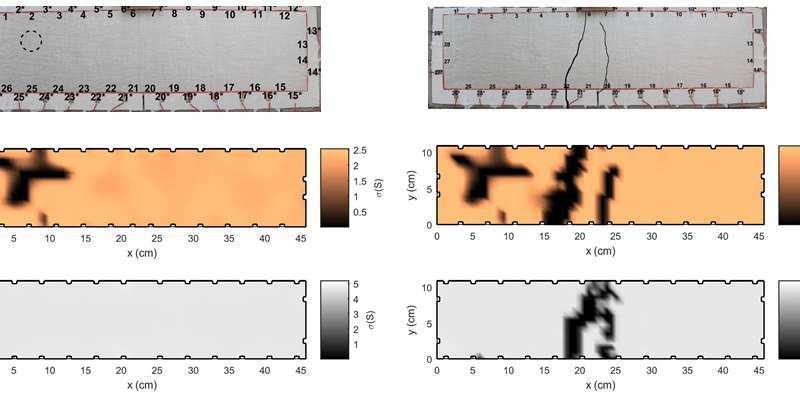 The top row shows photographs of the sensing skin on a concrete beam surface before and after cracking the beam. In the top left photograph, the dashed circle indicates an approximate location of an embedded chloride solution reservoir. The second and third row illustrate the EIT reconstructions of a (chloride and crack-sensitive) copper layer and a (crack-sensitive) silver layer, respectively. Before cracking (left column), the copper layer shows a chloride damage in the location of the chloride reservoir, and the silver layer is intact. After cracking (right column), the copper layer reveals both the chloride damage and the cracks, while the silver layer shows only the cracks. Credit: Aku Seppänen. "The skin performed really well," Pour-Ghaz says. "We were able to detect cracks as small as a few hundred micrometers; and we could very accurately detect any instances in which chlorides came into contact with the skin. "We want people to be able to detect problems very early on," Pour-Ghaz says. "And while this proof-of-concept looked at concrete, the technology – if properly applied – could be used on structural materials from metals to polymers." 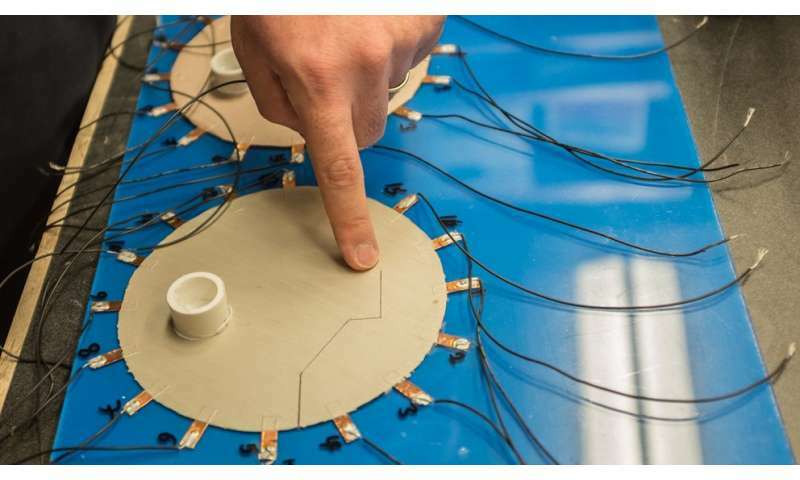 The researchers are in the process of conducting experiments of the sensing skin on a large-scale structure, more accurately reflecting the size of real-world structures. The paper, "A Functionally Layered Sensing Skin for Detection of Corrosive Elements and Cracking," is published online in the journal Structural Health Monitoring.